We can't be much clearer than that headline. Carmen Sucart, wife of A-Rod's cousin Yuri, says a few years back, Rodriguez once came to the Sucarts' house (that A-Rod gave to them) and threatened them to keep their mouths shut about his performance-enhancing drug use. Then, he peed on the floor as a message. "Alex is an a———." Carmen Sucart said on Thursday. "He is a bad person." "He was so arrogant, he came into my house like he thought he was a god," Carmen Sucart said. 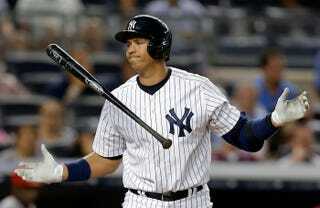 A-Rod? Thinking he's a god? No way.